I love the fact that you always have a dress or skirt on. Is this your choice because you prefer them or is it something to do with the show? Now here’s a memory question for you! (oh brother!LOL)…In the tragic hospital scene of Steve’s “death” in 1990, the magazines reported that it was your choice during the “death” bed hand holding scene to climb up into Steve’s bed and lay your head on his chest and hold him. After all those years that Steve Johnson held Kayla Caroline that scene is still one of the most profound scenes on daytime I’ve ever seen. Do you remember climbing into Steve’s bed and holding Stephen? Was that possibly your idea? Your first line was “You’re my best friend…I love you.” Honestly Mary Beth as sad as it all was, to me, even if it was scripted that way it was THE MOST poignant scene that meshed two characters with two real forever friends and I’m just so grateful it was performed that way and hope you or you and Stephen has a hand in that scene. There is no other scene in daytime as moving as that choice was made, and frankly it’s exactly the way these two characters/performers are; connected even after life. You are adorable..an inspiration. Thank you Mary Beth. Great blog! You are so right about aging gracefully. I am trying too! Loved when I heard your wind chimes in the background. Another great Q&A blog. Thanks Mary Beth. I almost feel like I am sitting in your garden having a girly chit chat even if I am on the other side of the world! As an aside, those little tid bits of information about you keeping some recent scripts and having to hug it out with Stephen before a recent scene has me hoping for an amazing and emotion-filled S&K storyline on our screens in 6 months!! Thank you so much for another thoughtful and open video blog. I really appreciate how easily you express yourself in an interesting way. If it makes you feel any better, I did not predict your answers 🙂 As to keeping Days scripts for a limited period of time, have you considered auctioning them when you’re ready to let them go? Are they too private? Or is that not allowed? I’m certain I’m not the only one who would love to see them. Thank you again for all you do and the bright light you shine on the world! I agree with everything above! The fact that I could answer most of those questions before you proves…..
A. You are definitely honest and never waiver from your answers over and over again! Another awesome plank. New questions and answers! Love it! Totally agree…the panic memory is amazing. It has saved me more than once! Where did you get your love for cooking. I know it runs in your family. Your aunt Ma Jose was a great cook. You really make it so easy to sit down and listen to you talk Mary Beth. The time just flew by. I know many of your fans have told you that you should host a talk show. You would be such a natural. 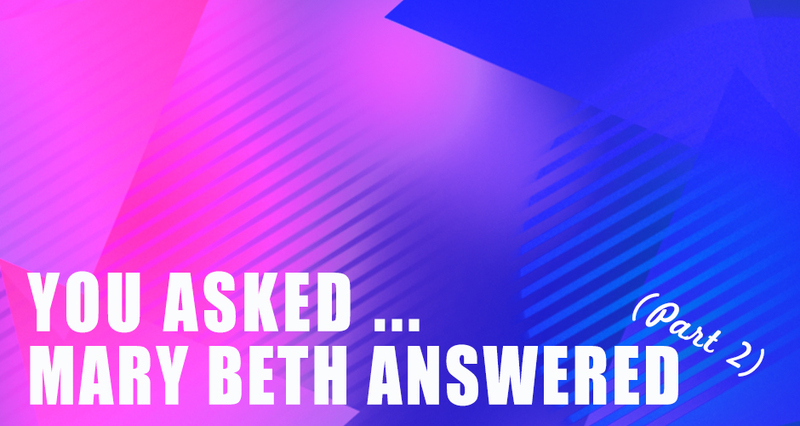 Yay!….another questions and answers video blog!…always love when you answer fans questions Mary Beth!….and as always thanks for sharing a little piece of your life with us fans! You Are Awesome!